I am so excited by the positive response to the Southport Dress last week. Thank you guys. I can’t wait to get started with the sewalong next week, but first I wanted to focus on some ready-to-wear inspiration. I have made many, many versions of this dress over the last few months and I love that depending on what fabric I chose, the feel of the dress changed completely. I love the ease of View A and the fact that it really is every day appropriate. I think it’s easier to get away with bolder prints on the short version because it feels a little less crazy in it’s length. I am still on the lookout for the perfect jungle print like number 3 and a chambray that is lightweight enough to not be too bulky around the waist like number 5. 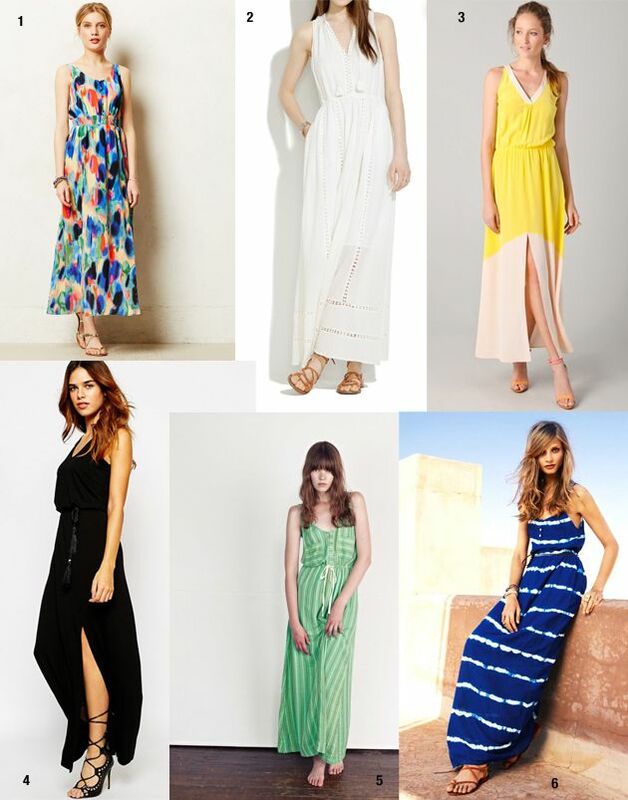 View B definitely has a bit more drama with it’s long maxi length and front slit. I love the idea of finding the perfect eyelet or lace like number 2 for a beach coverup and have plans to do a little shibori dying like number 6. Although of all of the versions that I have made, I have to admit that the black rayon challis Southport that I made like number 4 is my most worn one. I love it paired with my jean jacket and sandals. I hope that these ready to wear versions gave you some inspiration for future Southport Dresses. I would love to hear what you have planned. i know! I am all about chambray and shibori right now. maybe we need so more shibori dying next girls weekend? OK. I need like five of these STAT. i love ikat! also on the hunt for the perfect tropical print this season. still lookin. ok, i can’t wait to see this!